Mini Diaper bag in pink printed fabric. Water proof PVC Lining inside. Zipper pocket outside. 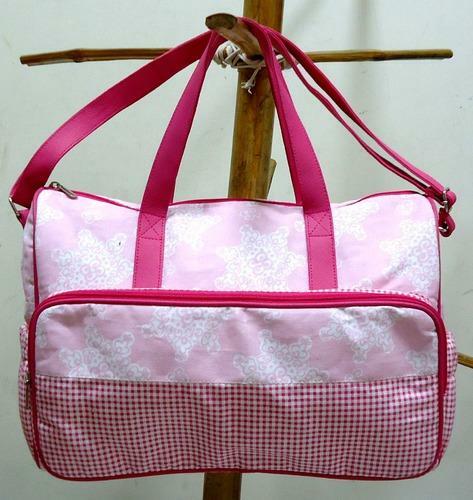 This Diaper bag is made in nice combination of blue chamber and red gingham fabric. PVC water proof lining inside. This is with changing pad and wet bag. Size: 21" X 7" X 14"
Diaper Bag with Wet Bag. PVC Lining inside, A complete set of changing pad, Food case with heat resistant foil lining and Bottle case. Bags made from Cotton Canvas and PU triming. We are a renowned manufacturer of Kids Diaper Bag which is used to carry baby diapers. These Diaper Bags are specially designed to fulfill the daily need stuffs of child care. The offered bag is skillfully crafted by our expert professionals using high quality material. These bags have adjustable handles to ensure complete comfort to the one who is holding them. We are one of the most reliable and trusted companies which are extensively engaged in providing Baby Girl Diaper Bag to our clients. Our range of kids & baby diapers and utility bags are absolutely hygienic for everyday use. The offered bag is skillfully crafted by our expert professionals using high quality material. The bag is an amazingly organized and functional with a super sleek style.